One Year Later, Should You Get An Xbox One Or A PS4? People ask us all the time whether they should buy a new-gen console? Should they get an Xbox One? A PS4? For a year, we've told people to not bother with either. Now, we think you should make the leap, especially if you're a console-only gamer. But which one to get? We're not going to tell you which one is better, because, frankly, it's an unresolvable debate. PS4 vs. Xbox One? There are good things and bad things about both machines. In fact, it's a little surprising how the rivals have leveled off. For most of the last year, we were far more impressed with the PS4 last year than we were with the Xbox One, but a series of software improvements and smart business decisions by Microsoft has closed the gap between the consoles. In late 2013, the sleek, powerful PS4 wowed us more than the chunky, clunky Xbox One. A year later? We think it's a more even fight. Nevertheless, the PS4 and Xbox One are not identical, so we've got some comparing to do. Hopefully the comparison will help you determine which console is better for you or whether you might want to go all in and get both… or neither. A note about Nintendo's console: Nintendo's Wii U has evolved into a superb console of its own, but is by and large a Nintendo machine. Want to play wonderful, new versions of Smash Bros., Mario Kart, and Pikmin? Want to play excellent sequels, such as Super Mario 3D World and the surprise Nintendo-exclusive Bayonetta 2? Want to do any of this on a console that lets you play the games on a handheld screen if your TV is being used for other stuff? Pay the $299 Nintendo tax and get a Wii U. Dwindling third-party support means that there is virtually no more overlap between the games released for XboxOne/PS4/PC and Nintendo's home console. A good thing, because you won't feel like your devices are redundant, but a bad thing, because you'll need to buy more expensive stuff to play every game. A note about PC gaming: If you have a good gaming PC or are interested in getting one, you may not need a PS4 or Xbox One yet. Most of the top games on the new-gen consoles—including such buzzworthy late-2014 games as Dragon Age Inquisition, Shadow of Mordor, Assassin's Creed Unity and Alien: Isolation are all available on PC. Many of the consoles' best indie games, like Transistor, Don't Starve, TowerFall: Ascension and Super Time Force are also on PC. Skipping the new consoles now and sticking just with a PC won't cost you access to that many exclusive games yet (you'd basically just miss the Sony-published PS4 games and some, but not all of the Microsoft-published Xbox One games). So if you can live without playing Infamous Second Son (PS4), LittleBigPlanet 3 (PS4), Sunset Overdrive (Xbox One), and Halo: The Master Chief Collection (Xbox One) and you've got a good way to play the best new games on your TV—and if you don't mind waiting until early next year to play the superb new first-person-enabled version of Grand Theft Auto V—then stick with PC gaming for now. They're both pretty beefy. The Xbox One and PS4 are both powerful consoles. The best-looking games for the Xbox 360 and PlayStation 3—Halo 4 and The Last of Us, arguably—are already visually outclassed by the likes of the new consoles' versions of Shadow of Mordor, Assassin's Creed Unity and Grand Theft Auto V.
They're not identical, but it's close. The specs for the consoles are not identical, and close analysis of this first year's games has regularly revealed a small performance advantage for the PS4 (higher resolution graphics, for example), the kind you might notice if looking at the game running on each console side-by-side. But Xbox One games tend to look phenomenal as well, and in at least one case—Assassin's Creed Unity—seem to perform better on Microsoft's console. History shows that developers get better at programming for consoles as the years go by, which would either close any performance gaps or accentuate them. It's too early to say. Games cost the same. Major game releases cost $60 each on both consoles. They've got (mostly) the same third-party games. The PS4 and Xbox One run many of the same games and largely have parity in terms of third-party support. All major games from Ubisoft, Activision and Take Two have come to both consoles. EA released the multiplayer shooter Titanfall exclusively on Xbox platforms and Microsoft secured console exclusivity for Dead Rising 3 from Capcom and the next Tomb Raider from Square Enix/Eidos (possibly a timed exclusive there). The massively multiplayer Final Fantasy XIV: A Realm Reborn is available for PS4, not Xbox One. Otherwise, from existing blockbusters such as Call of Duty, Assassin's Creed, FIFA and GTA to next year's Metal Gear Solid V, Evolve and The Division, big third-party games come to PS4 and Xbox One and generally on the exact same day. There aren't many exclusives on either side. Neither system has an overwhelming number of exclusive games yet, so PS4 and Xbox One owners would likely still find a lot of overlap in their software collections. They both update when they're turned off. Both of the new consoles are designed to patch and update your games (the PS4 does this more smoothly at the moment). Both have somewhat cluttered but well-stocked online stores. They each ship with 500GB hard drives and require just about every game to be installed (the Xbox One supports external hard drives; the PS4 does not, though the PS4 HDD is pretty easily swappable for a bigger one). They both let you start playing most games while they're downloading or installing. Achievements and trophies are still a thing. They both have Achievement-like systems. As has been the case for a while, Sony calls theirs Trophies. They both support cross-game voice chat for parties of up to eight people. Cross-game chat was previously something the Xbox 360 could do that the PS3 couldn't. You can use your real name on both. In a change from the previous generation, both allow players to be identified by their friends by their real name instead of by a handle. This is optional, so you can keep masquerading as CoolBro420 if you want to. Both controllers are similar to their predecessors. They each have evolutionary controllers that are similar to the ones from the previous generation, though the PS4's new DualShock 4 feels like the more substantial design overhaul when compared to its predecessor the DualShock 3. The Xbox One's controller includes more advanced force feedback rumbling, and it runs off of AA batteries. The PS4's controller has a colorful light bar, a touch pad, and a speaker, and runs off of an internal battery that you'll need to regularly recharge (thankfully, unlike the PS3, the PS4 lets you charge your controller while the system is in sleep mode). None of those features have amounted to anything all that special, so, for controller preference, it's still largely a matter of which one you personally prefer. Additional controllers for both consoles cost $60 each. They both charge players for online multiplayer. You need PlayStation Plus for the PS4 ($50 annual subscription) and Xbox Live Gold for the Xbox One ($60 annual subscription). Both paid services give you games. Both the PlayStation Plus and Xbox Live Gold services give players access to free games each month and let you keep the games as long as you're a subscriber. Because there are relatively few new games out for the new consoles, the freebie games for PS4 and Xbox One tend to be indies, whereas the freebie games subscribers can get for last-gen consoles tend to be bigger releases. For example, in November 2014, Gold users can get a game called Volgarr The Viking for free on Xbox One but also get Viva Pinata: Trouble In Paradise and Red Faction: Guerilla for the Xbox 360. That indie/big-game divide isn't always the case, though. Keeping it a bit more indie all around in the same month, Plus members get The Binding of Isaac: Rebirth, Steamworld Dig and Escape Plan (originally for the PS Vita) for free for PS4, but also Frozen Synapse and Luftrausers for PS3. And in December, PS4 users of Plus will get free copies of the big-budget DC Comics fighting game Injustice. They're both indie-friendly. Sony and Microsoft have both aggressively courted indie game developers and have been rolling out indies on their platforms (Nintendo's been getting into this, too but, of course, the PC is still by far the leading platform for anyone who wants to play great indie games). Neither one is backwards compatible. Neither system will run a game disc from the previous generation, though the PS4 does offer last-gen games via a streaming program that will be explained below. Both offer cameras of limited utility. The Xbox One used to ship with a Kinect sensor that could be used for voice and gestural control of the system's interface and in many of its games. The Kinect is no longer packed in and has seen few games made that require it (standouts include Dance Central Spotlight and Disney Fantasia: Music Evolved). It costs over $100. Sony's PlayStation 4 Camera ($60) allows for some voice control of the system. Both devices allow users to log into their respective consoles via facial recognition. Neither feels essential to the new-gen console experience. Both normally cost $400. When the Xbox One launched, it cost $500, $100 more than the PS4. But the removal of Kinect from the console's base offering dropped the two machines down to the same price, $400. Microsoft is currently running a holiday promotion that drops the Xbox One down further to $350. Both machines are often bundled with games. Both let you stream lots of different media. Both machines support a variety of media-streaming apps. They both have Netflix and Amazon Prime. and Hulu Plus. There are some notable differences: Xbox One has HBO Go, which the PS4 doesn't yet have. The Xbox One also has an NFL app of limited utility. The consoles both play Blu-Ray and DVD movies. You can livestream from both without the need of any other devices. You can capture gameplay footage and edit it on either console, then upload it (Sony has a couple of theoretically temporary advantages here in offering an easy screenshot-taking option and for local saving of videos to a USB stick). The PS4 is slim, the Xbox One is chunky. One of the biggest differences between the PS4 and the Xbox One is that, well, the PS4 is a slick, slender console and the Xbox One is the Duke controller of game consoles. The PS4 lets you play streaming PS3 games (it costs money). The PS4 lets users play PS3 games through the recently-launched PlayStation Now service. You can stream any of a number of games if your Internet connection is fast enough to handle a two-way streaming signal (you're basically remotely playing on a PS3 that is in some server farm somewhere). The games will support your older PS3 save files, but you have to pay to access these games, even if you owned them. The Now service is pricey. Four-hour rentals tend to go for about $2-$5 with longer month-long rentals nearly matching the price of just buying an old copy of the game. Of course, the store-bought copy of the PS3 game wouldn't run on the PS4, so it's really your only option. The Xbox One is not backwards compatible at all. You can play PS4 games on your Vita handheld. People who own a PlayStation Vita can use it to "Remote Play" any game running on their PS4. In theory this means you could play a PS4 game on a Vita from anywhere in the world, but Remote Play is dependent on having a really good Internet connection. In our experience, Remote Play is best for same-room or same-house sessions when the TV is either too far away or in use for something else. Remote Play has gotten much better over the last year, especially when game developers go out of their way to come up with solid adapted control schemes for the Vita. The PS4 lets you "hand the controller" to a friend in another zip code. The PS4 also supports a new feature called Share Play, which allows any paying PlayStation Plus subscriber to "host" a session of most PS4 games that they own, enabling a second, remote PS4 user to spectate the host's game through their console and on their TV. The host player can virtually hand control of the game to the guest player, enabling the recipient to play PS4 games that they don't have, remotely, via their friend's PS4. Sony sells this idea, in part, as a way for one player to help another through a tough spot in a game. There might be too much lag for that to work for twitch-based games, but the service otherwise works pretty well. Share Play sessions are limited to an hour, but the clock can be re-started at any time. You'll need a decent Internet connection and a PlayStation Plus subscription for it. The Xbox One lets you suspend your games. The Xbox One doesn't have a Remote Play option nor a Share Play mode (no reason why they couldn't eventually get the latter), but it does have an excellent game suspend mode. Console gamers have been accustomed to having to load a video game before they start it, but the Xbox One can actually suspend a game, let you power the console off (into a low-power mode) and then, when you turn the machine back on, let you pick up the game right where you left it—no loading. It can only do this for one game at a time, but it basically removes the need to boot up the game you've been most avidly playing. Turn on the console and the game is waiting for you to continue playing, exactly where you left off. Sony indicated back in early 2013 that it was going to offer a similar option, but they've yet to deliver. The Xbox One can show two things at once. The Xbox One has a semi-useful thing called Snap. Basically, it's a split-screen option that will run certain applications in a vertical band on the right side of your TV screen while running a game or other application on the left. The console does this thanks to its unusual system architecture that has different operating systems handling what's on the different portions of your TV. The problem is that Microsoft hasn't found many good uses for Snap. You can snap a list of the Achievements for the game you're playing, which is cool if you want to track your progress in achieving them in real-time. You can Snap a TV signal from your cable box, if your cable box is plugged into your Xbox One. You can keep a list of your Xbox Live friends snapped, watch a Twitch Stream snapped, and so on. A lot of that may sound cool, but most of it is stuff you might as well do with a second screen like your phone, tablet or laptop. Xbox One has DLNA support, PS4 does not. Sony has taken some hits for still not supporting DLNA in-home media-streaming yet. They've indicated that they will, but at the moment, the Xbox One is the only new-gen console that will let you stream media from other devices in your home. The Xbox One can integrate with your cable box. One of the biggest differences between the consoles should be that the Xbox One has an HDMI-in. That means you can plug a cable box—or even another console—into the Xbox One and have its video and audio play through the Microsoft machine. The Xbox team initially promoted this option as a way to unify your home entertainment devices, by having everything that would connect to your TV funnel through the Xbox One. In theory, your cable TV signal wouldn't just flow through the Xbox One but be improved by it through a feature called the One Guide that would allow you to track what's on TV and what's also available through streaming apps. In practice, most of us at Kotaku who initially plugged our cable boxes into our Xbox Ones have since disentangled them. The benefits weren't worth any signal lag that we experienced. 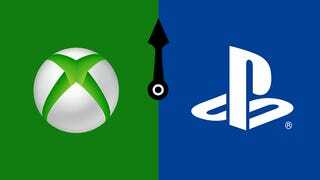 In the long term, we suspect that the biggest differences between the Xbox One and the PlayStation 4 will be the games. Currently, there are a handful of notable exclusives that are on one console and not its rival. The Xbox One has these games: The four-classics-in-one Halo: The Master Chief Collection, the acrobatic third-person shooter Sunset Overdrive, the fun racing game Forza Horizon 2 (also on Xbox 360), multiplayer shooter Titanfall (also on Xbox 360 and PC), massive zombie-slaughtering game Dead Rising 3 (also on PC), and 2D time-warping game Super Time Force (also on PC). The PlayStation 4 has these games: The open-world action game Infamous Second Son, Game of the Year caliber survival game The Last of Us Remastered (a pretty port of a PS3 game), sidescrolling shooter PixelJunk Shooter Deluxe (a port of two PS3 games), another top sidescrolling shooter Resogun and the user-creation-centric sidescroller LittleBigPlanet 3. Sony has more top internal game studios, but Microsoft has a pretty good crew, too: While Microsoft seems to still be interested in grabbing exclusives from third-party publishers (see: the next Tomb Raider) and Sony is publishing a spiritual sequel to the Dark Souls games in next year's Bloodborne, most of the consoles' exclusive games will come from first-party studios. Sony has the advantage here with a network of game studios that include Naughty Dog (Uncharted, The Last of Us), Guerilla Games (Killzone), Japan Studio (Ico, The Puppeteer), Media Molecule (LittleBigPlanet, Tearaway), Polyphony Digital (Gran Turismo), Sony Santa Monica (God of War), Sony San Diego (MLB: The Show), London Studio (Playroom) and more. Microsoft's operation is smaller, with its major internal studios consisting of 343 Industries (Halo), Lionhead (Fable), Rare (Kinect Sports), Turn 10 (Forza), Black Tusk (forthcoming Gears of War), and, technically, Mojang (Minecraft). Do you love baseball? If you're into baseball games, Sony makes MLB: The Show, the de facto only one that matters. The Xbox One has no Major League Baseball games. Do you love EA? If you like EA games, Microsoft has an exclusive on a paid program called EA Access that provides discounts and early access to some EA games as well as free copies of some older releases. We could go on an on. Doubtless, many owners of the systems will have a lot that they can add to this, and we encourage them to do so in the comments below. But do we really not have a preference? If you asked any of us on the staff to pick between an Xbox One and a PS4, would we really not be able to make a choice? A year ago, and even just six months ago, a lot of us leaned heavily toward the PS4. The system had some special features, but we liked it primarily for the one thing we wanted it to do—play games—really well. The Xbox One was a more confusing machine that seemed weighed down by a bunch of design decisions tied to using the machine as an enhancer to a cable TV box and yet shipped without some basic gamer-friendly features like a controller battery-power indicator or even a way to tell how much hard drive space you had left available (both issues have since been fixed). Microsoft, however, started closing the gap with a series of system software updates that made some of its odder features, such as Snap, work better. It turns out that the Xbox One is a perfectly good modern gaming console, a fact underlined by some strong fall Xbox-only games amid a surprisingly weak late-2014 PS4-only gaming line-up. As a result, we feel pretty good about both consoles these days. You kind of can't go wrong. Aside from the temporary holiday discount for the Xbox One, the two machines basically cost the same amount of money. They largely run the same games. If you're a huge Halo fan, then of course, get the Xbox One. If you're a baseball person, the PS4 is the no-brainer. But the vast majority of new-gen games run on both consoles. Perhaps the deciding factor will ultimately be wherever your friends are. Both consoles are machines geared toward social interaction. They're full of activity feeds and support for chat and messaging. They're designed to make you feel close to and competitive with the friends you have who also are in the same Xbox Live or PlayStation Network universe. So maybe, after reading all of this and weighing the pros and cons you just ask your friends. Which one do they have? Go get that one. Or decide to get the one you want and then convince them to come along and do the same.